When I hold them in my hands now that I am home, each one represents a world unto itself. They transport me to a time outside time, when I was so enthralled I forgot to eat, drink, or relate to the outside world. Each tiny bead represents a human’s touch, a woman far away… and yet so much like me. Hour after hour, we sort myriad and brilliant colors and shapes, enthralled. Each bead formed and glazed by the touch of a hand. Each one, a world unto itself. A bell rings and a voice calls for tea. Stunned, we look up at each other. Tea-time in Kenya is served in late afternoon. “What time is it? !” One of us asks in shock. It is indeed, four o’clock. Six hours came and went. We forgot to eat, drink or note the passing of time. Back in the storage room where we hunt through bin after bin of loose beads, we hear the clanging of dishes and then lilting voices harmonizing acapella: women worshiping, the sound of hope rising. Kazuri, now a fair-trade organization, was founded in 1975 to provide employment for disadvantaged women. Now, each day over 300 single mothers emerge from Nairobi’s largest slum and make their way to the workshop. 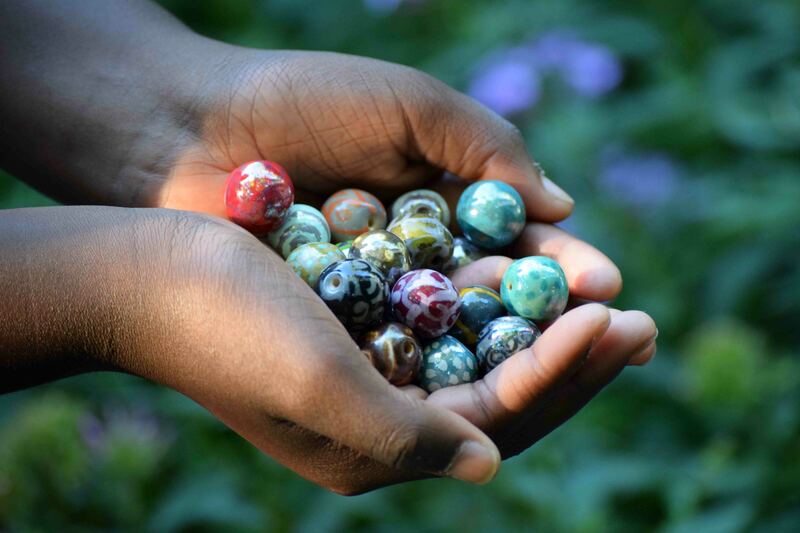 They earn a fair wage, receive medical care when needed, and create beautiful ceramic beads and other products. Soon after tea-time, we gather up our treasures and call it a day. Now, back in the US, as I design our beads into earrings, I ponder the artisans who formed and glazed each bead. In the global scale and the span of history, each woman who touched each bead is so very small. The women who will wear the earrings I make are so very small. Yet I imagine the Creator, looking out over the myriad and brilliant colors and shapes of His Creation, utterly enthralled. Each one held in His hand, delighting His Heart – so small, and yet so fiercely beautiful. The earrings below (and many more) are currently available through Pamba Toto: Kazuri earrings. Pamba Toto’s profits benefit Sanctuary of Hope, family-style homes for orphans in Kenya. Thank you so much for your visit, Terese!